The sun crept over the horizon, the mist and fog cleared and there it was, the water in which I would swim in very shortly. The hustle and bustle of the already arriving athletes greeted my ears. Anticipation continued to rise in my stomach, reaching my ears. I barely slept, and couldn’t eat anything when I got out of bed in the early hours of the morning. Nervous couldn’t even begin to describe how I felt about taking on this feat. This idea, this dream, this goal had been taunting me for years. Even before I accomplished other feats of athletic strength that I had discovered after college, I had known that this was something I wanted to do someday. I had written into my bucket list years ago, thinking it would be fun to try someday. I watch others arrive with their own cheer squad, as I unloaded my bike and gear from my car. I didn’t bring anyone with me, which in the end was something I needed. I needed to do this one on my own. On my own, for someone who seeks approval and looks to others to define who I am, is a hard thing. But I needed to do this hard thing. I needed to prove it to myself, that I hadn’t let myself fall too far behind where I wanted to be. As I walked through the body marking station and set my bike and gear up, I took in all that was happening around me. Women, all shapes and sizes were setting up their gear. 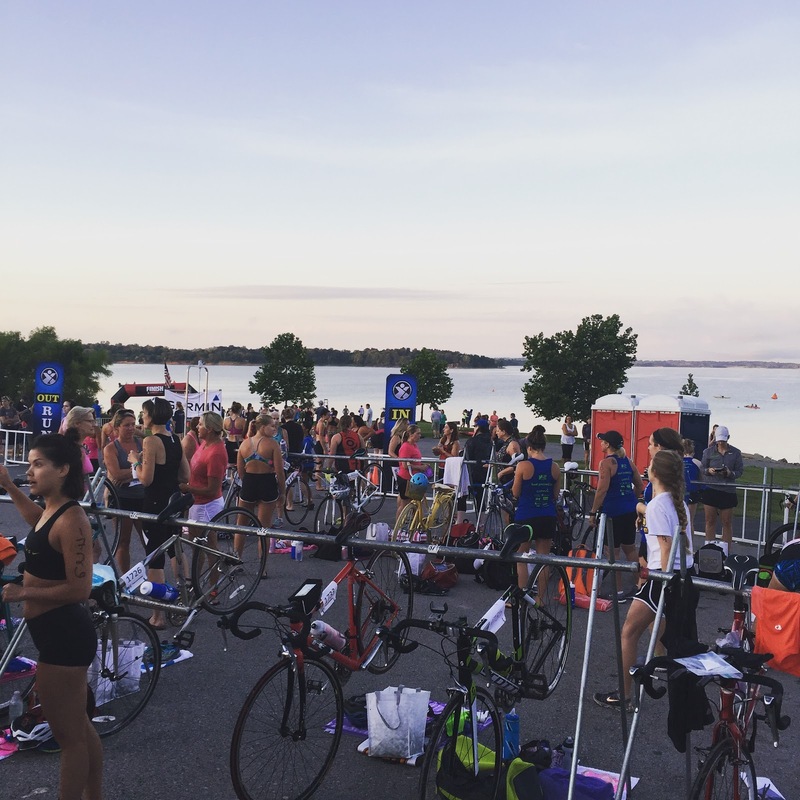 The pro athletes, the groups of friends, the young girls, all seeking to tackle this course. A different kind of energy infused the transition area, an energy that can’t be found many other places. The kind of energy that comes from doing something out of the ordinary, the something that isn’t for everyone, the something that pushes your body past what you think it can do. Sure, I had run races and done hard things in the last 6 years of my life, but this was the one thing that I knew that would show me what I was made of. This gave me a chance to redeem a very hard summer. For me this was more than a race, it was marking point in my life. See I had just spent the previous 2 weeks laying on my couch in a depressed state, angry that I didn’t have the summer break I used to have, mourning the changes going on in my life. Some good, some hard, but changes none the less. I slacked off in my training, too sad and lethargic to get out in the heat and train. I was tired, spent from a hard school year and harder year emotionally. God has wanted to do stuff in my heart and mind and I had been running, because I know that what he wanted me to surrender was not going to be easy. Putting down dreams and hopes even though you know that your God is faithful is still a hard thing. This event has become a pivot point. I want to choose to live differently than I have before this time. I want it to be a moment that I told myself “enough” time to move forward, to take steps toward where God has me headed. So that morning as I got out of bed, earlier than I had in 2 months, I faced a big goal and some ugly demons in my head. I couldn’t have just not done it, not shown up, telling others that I was injured and not prepared. But that isn’t how I roll. I was going to do it. And…I am glad I did. During the triathlon, I biked past women cheering others on, shouting encouragement up hills and towards the finish. 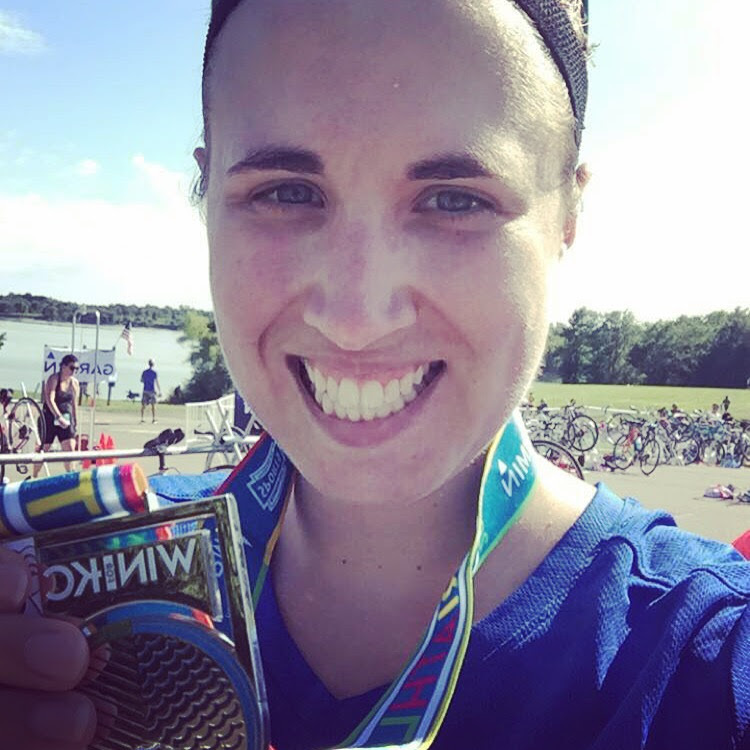 I ran with women who were ready to give up. People I didn’t know shouted my name and gave me cheers to keep pushing myself further. So friends, I write to speak out about doing hard things, about pushing yourself to not settle in with the demons, to give yourself the chance to prove yourself wrong. More than anything to wake yourself up from a stupor that comes from wallowing during hard seasons. Today is someday, I can start over and begin the ascent from the valley, to move toward a better day. Not to say it is easy or without challenges, but that when we put one foot in front of the other, you will continue to move forward. Friends, choose to move forward. 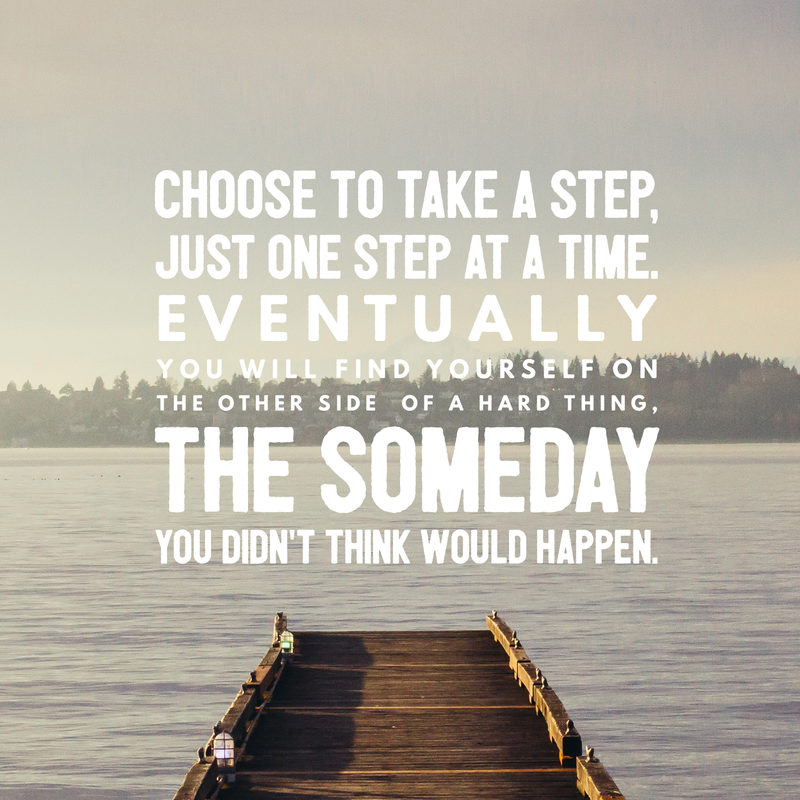 Choose to take a step, just one step at a time. Eventually, you will find yourself on the other side of the hard thing, the someday you didn’t think would happen. So friends, what is one hard thing you have been putting off to someday? (Maybe yours isn’t physical, but emotional.) What is one step you need to take to get there? Would this be the year that everything changes? Would I be put into the class with the cute boy I liked? Would everything be different this year? Would I suddenly become popular? Before the first day of school, I eagerly anticipated the possibilities. However, things never seemed to pan out the way we imagine they would. Life isn’t the romantic comedy that we thought we were starring in or a sitcom with a laugh track. As we get older we face the harsh reality everyday. We experiencedisappointments, failed hopes, and desires unmet. We encounter hard things, impossible things, and failures. If you are anything like me over time after years of disappointments, you stop dreaming, and stop hoping. You jump on the cynical and bitter train. You start to fear the first days, you start to fear what will happen next. You are waiting for the other hammer to drop. None of your hopes and dreams have come true and you begin to fear that they never will. As I write this, I am struck by the fact that this perspective is contrary to the what God says about our hopes and dreams. He knows us better than we know ourselves and none of this, none of our heartaches are lost on him. So if you are sitting on the disappointed bandwagon like me, let me give you a new anthem for your soul. Even in our suffering and disappointment God has a purpose in it. Though failures happen, he isn’t done with us yet. 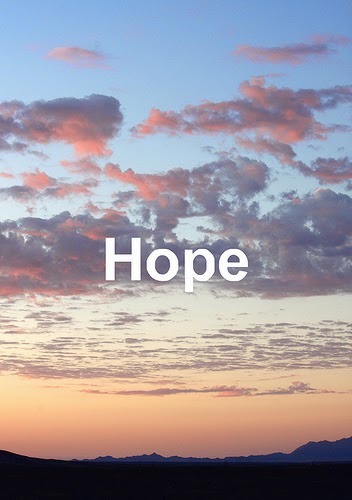 He has not given up on us, and even our dashed hopes are known by him. You, the beautiful soul reading this, were stitched together by our Father the creator. He made you with a plan in mind. He isn’t like us with good intentions and no follow through. His plans will come to fruition in his own perfect timing. As you work through those disappointments and long lived desires of your heart, remember that you have not been left on this earth to bear these things alone or lightly. Delight in him and allow him to shape new dreams. What are your new dreams? What disappointments do you need to let go of? I do this sometimes, I overeat something and I get really disappointed in myself, thinking that “I should know better than this after a year of changing my life.” I have extremely high expectations for myself, that when I fail, I tend to be really hard on myself. And perhaps that is why I was 24 years old and 255lbs. I would continually fail, and just figure there was no reason in starting over, I was already there. I was paralyzed into doing nothing about my mistakes or failures. However…what I have learned in the last year is that tomorrow is a new day. Tomorrow, I can try again with eating well. I can try to be self-controlled and diligent about what I put in my mouth. As I think type this out and I think….wow….this translates in every area of my life right now. Spiritually, emotionally, professionally. I struggle with high expectations in every area and sometimes I have to allow myself to experience God’s grace that fills the gap when I mess up, and that I don’t have to continue to try to save myself. (Who do I think I am that I can do that anyways?) Professionally, when I have a horrible day when I feel like I didn’t teach them anything, I have to remember that the next day is a new day and who knows where those preteen’s emotions are going to be. Am I alone in this thinking? Or do you also struggle with holding the previous days mistakes against yourself? So much so that it prevents you from changing or moving forward?